At Echo Valley in Topside, Marijus Šmigelskis opened a slightly contrived but rather hard little problem named "Turboset" 7C+ which involves a deperate pull off a polished sloper to catch a small edge. 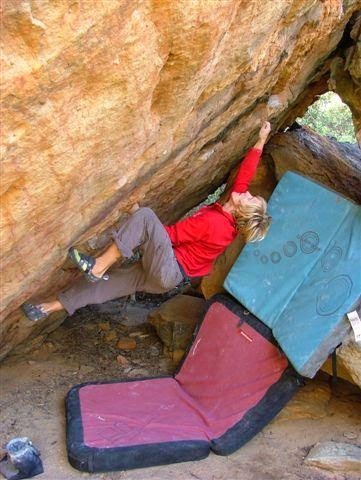 With rumours of the closure of the main boulder at TDA flying around, many Cape climbers have been busy tying up loose ends and trying to send their remaining projects. Marijus Šmigelskis managed to establish another worthwhile linkup traverse which starts as for "Super Skunk" and joins "THC", resulting in "Chinese Nosebleed" 7C+. He then returned a few days later to add an even further extension to the start and bumping the grade up one notch to 8A. This latest addition was named "The Last Line of Defence" and starts as for "Inertia" 7A+ and traverses rightwards to join "Chinese Nosebleed". Back in Rocklands, Shaun Harris repeated "Sean's Roof" 7C and added the classic "Sunset Arete" 7C to his ticklist. Marijus Šmigelskis took a visit to Frenchside and managed to do "Stroh 80" 7C+ as well as "Scorpion" 8A (which has lost some of its holds) in 3 tries after figuring out the sequence.